So-called "learned societies" started to crop up in the 17th century in Europe: the Italian Accamdemia dei Lincei (1603), Académie Française (1635), the German Leopoldina Academy of Sciences (1652) and the Royal Society of London (1660) and, in Naples, Giambattista della Porta's Academia Secretorum Naturae (1580). They all existed to study nature, although at the time that included things we might exclude today, such as astrology and transmutation of metals. There is a long string of great names that follow in the 1600s, including Galileo (1564-1642), Spinoza (1632-1677), Locke (1632-1704), and Newton (1643-1727), that primed our culture for the French Enlightenment in the mid-1700s, a period that brought to bear the powers of human reason on the world around us. There arose a whole class of professional "scientists" —geologists, physicists, astronomers— whose life was dedicated to their particular disciplines and whose powers of reason were, by 1800, able to use the technology and instruments of the Industrial Revolution. The mid-1700s also sees the beginnings of what eventually developed into the Royal Physics Laboratory in Naples, a vast collection of scientific instruments that are now distributed among historical displays at the Physics Museum of the University of Naples, the Capodimonte Museum and elsewhere. The original instruments were the so-called "mathematical instruments" that were in the materials that belonged to Elizabeth Farnese, mother of of the new king of Naples, Charles III and which he inherited and brought with him to Naples when he came to the throne in 1735. Over the decades, the Physics Laboratory increased with the production and arrival of newer instruments. Science made great strides with the arrival of the French in Naples in 1806 and that period may be seen as the beginning of the division of "science" into "sciences." The Zoological Gardens came into existence, as did the Botanical gardens; and disciplines such as physics and chemistry were endowed at the university. In 1808, Joseph Bonaparte (the King of Naples appointed by the real Bonaparte!) founded the Royal Society, which, with various name changes, survived until the incorporation of Naples into united Italy (1861). In the early 1800s, the serious pursuit of the natural sciences left the domain of static learned societies in favor of more dynamic groups driven by newly endowed science departments at universities. There were suddenly science congresses! In Italy they started in Pisa in 1839. In 1845 Naples hosted the seventh edition of the Congress of Italian Scientists. This was not a congress for a particular discipline, nor even one for what we today would call "natural" science, but rather a grand all-around smörgåsbord of science and technology. The congress met from September 20 through October 5, 1845. The invitations specified that the event was for professionals and serious amateurs alike, no doubt a recognition of the long tradition of fine work done by amateurs in many disciplines (as is still the case in astronomy, for example.) There were over 1600 participants and observers from the Kingdom of Naples, the rest of Italy and elsewhere. Papers were presented in agronomy, zoology, medicine, physics, chemistry, paleontology and engineering (specifically, railway construction). Economists came, as did students of the ancient culture of the Etruscans, and the program had the unusual pairing of archaeology and geography in the same category. (Opening remarks on the benefit of such congresses were, indeed, given by Neapolitan geographer Ferdinando De Luca, vice-president of the congress and one of the persons most responsible for putting geography on a scientific footing in Italy.) There were, of course, some papers on Mt. 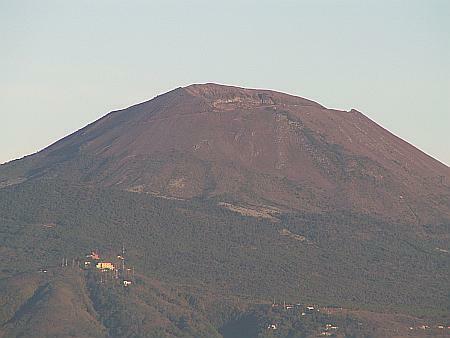 Etna on Sicily, but the home-town volcano, Vesuvius, stole the show, for the congress was the venue for the opening of the new Vesuvius Observatory by director, Macedonio Melloni. The congress proved to be a feather in the cap of King Ferdinand II of Naples, who originally had had to be convinced to go along with the whole idea in the first place. The guests were housed elegantly, and an orchestra from the conservatory played for the ceremonies. Also, a number of non-science freeloaders showed up, including a young Theodor Mommsen (eventually, great classical scholar and winner of the 1901 Nobel Prize for Literature) and Wolfgang Maximilian Goethe, jurist and nephew of the other Goethe. I don't know why they were there, and if I, myself —a linguistics student— had not regularly frequented geology department Friday-afternoon beer parties in college, I might be tempted to say something snide. 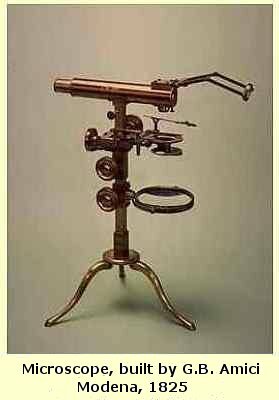 Image at top: Microscope (G.B.Amici, Modena, 1825) in the Physics Museum of the University of Naples. Photo from The Scientific Historical Heritage in the Physics Museum of the University of Naples by Edvige Schettino. The author is Director of the Physics Museum and Professor of Physics at the Federico II University of Naples.